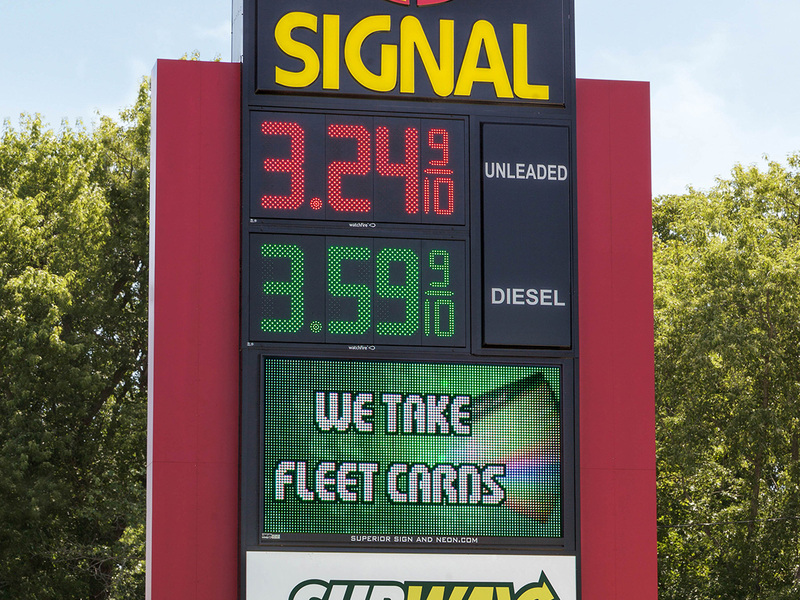 Watchfire’s gas price signs have the wish list of features station owners and operators have requested most, making them easy to install, maintain and operate. 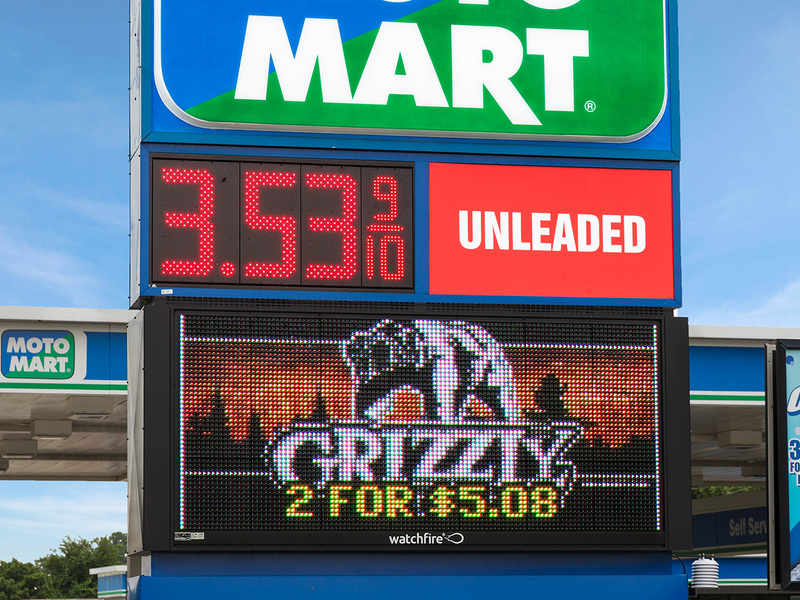 They offer a bright fuel price display that can be changed safely, day or night, with the included 5-button remote within a line-of-sight range of up to 200 feet. 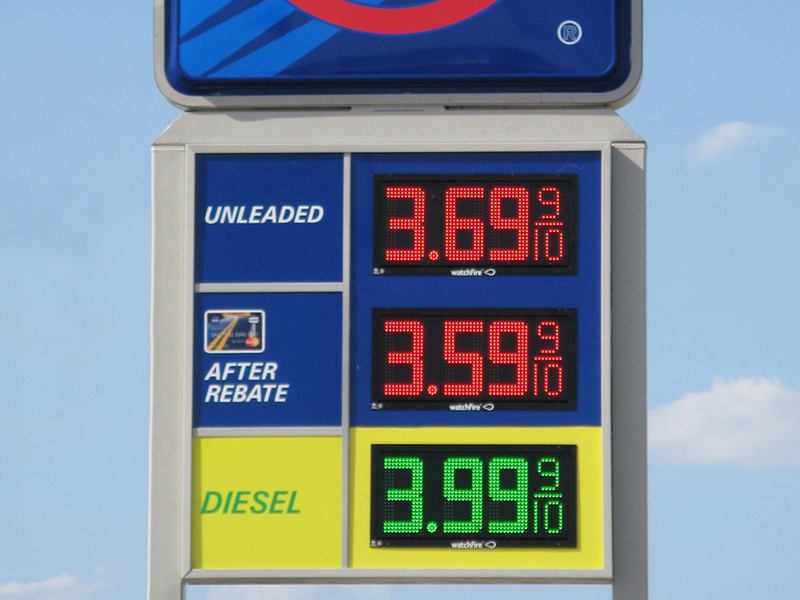 Optional POS capability (such as VeriFone) lets you sync your sign with in-store pricing to update instantly. The fully assembled unit is a complete ‘plug and play’ sign solution. Front ventilation makes installation or retrofit quick, easy and affordable while boosting energy efficiency and lengthening LED life. Our built-in ventilation also eliminates the need for add-on kits or expensive electrical work. The energy-efficient design will pay dividends every time you open your utility bill. 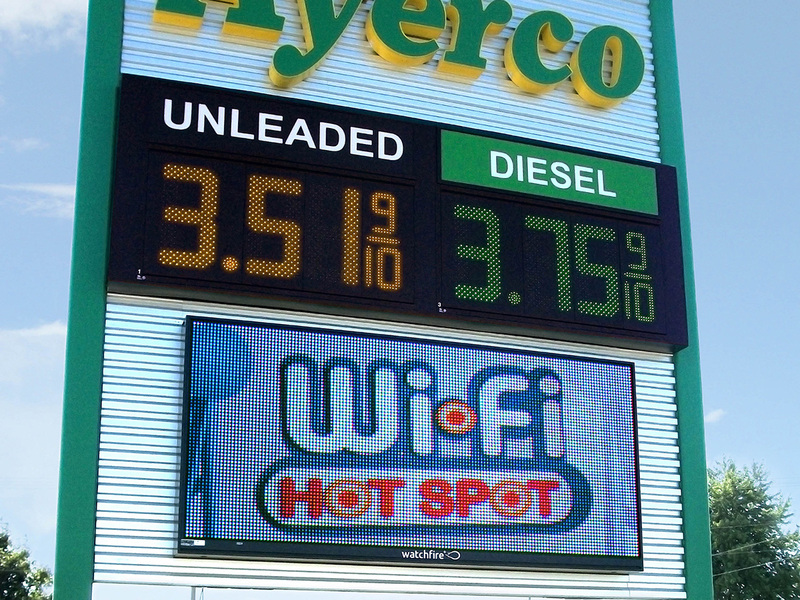 Watchfire customers love the peace of mind that comes with owning a high quality outdoor display. As with other Watchfire products, Price Watcher features fully-encapsulated modules that seal out moisture, dirt and contaminants. Our module design is proven to last longer and perform better after years in the field. 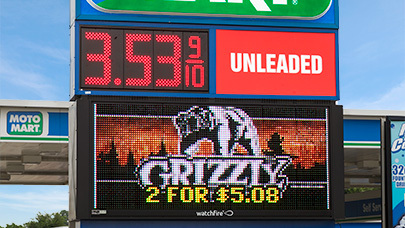 A thick character stroke and windowless design make Price Watcher highly visible, while zoning-friendly brightness settings automatically adjust to appropriate day and nighttime levels. 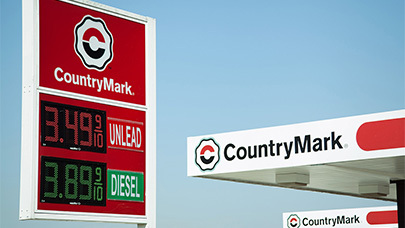 Custom controls let you set the brightness of specific digits or the whole sign. 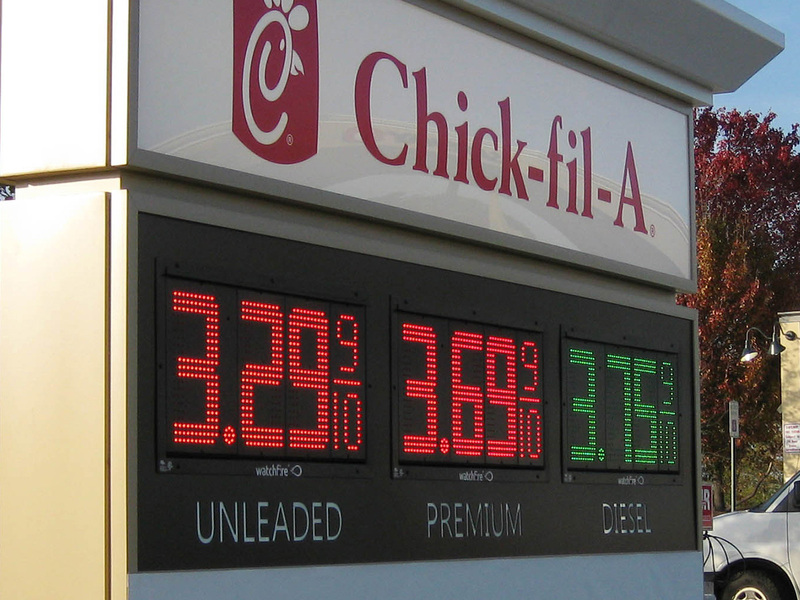 Use Price Watcher to advertise prices for other merchandise by customizing turning digits on or off, or using the decimal and nine tenths to display prices in any format. 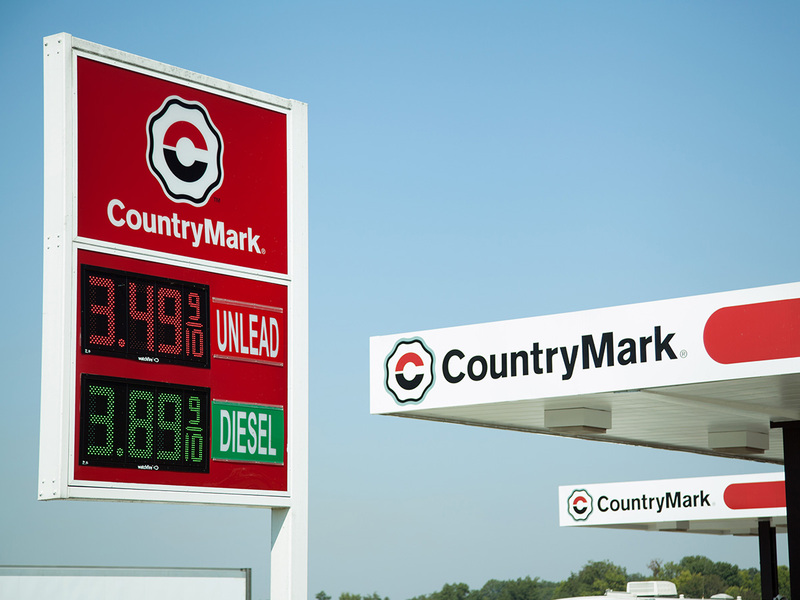 Choose from gallon or liter pricing in red, green, amber or white characters. 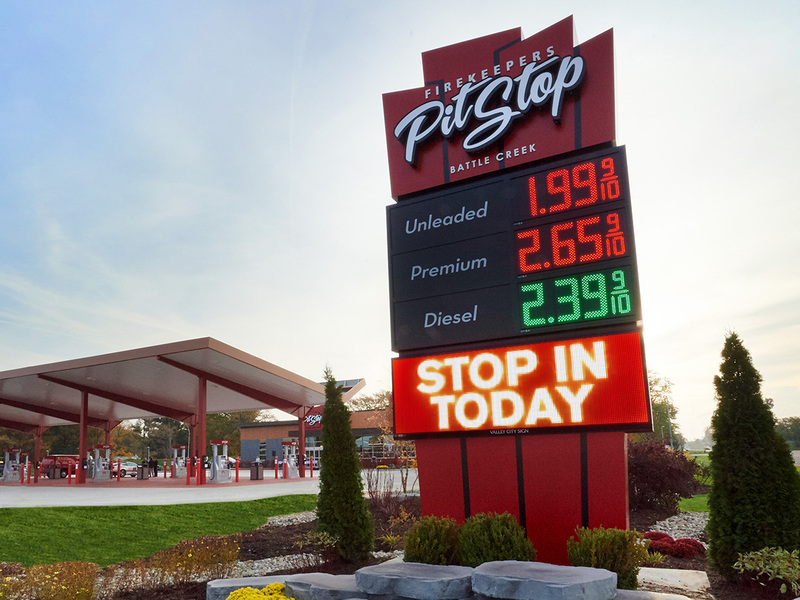 Download our product guide for the C-store industry. 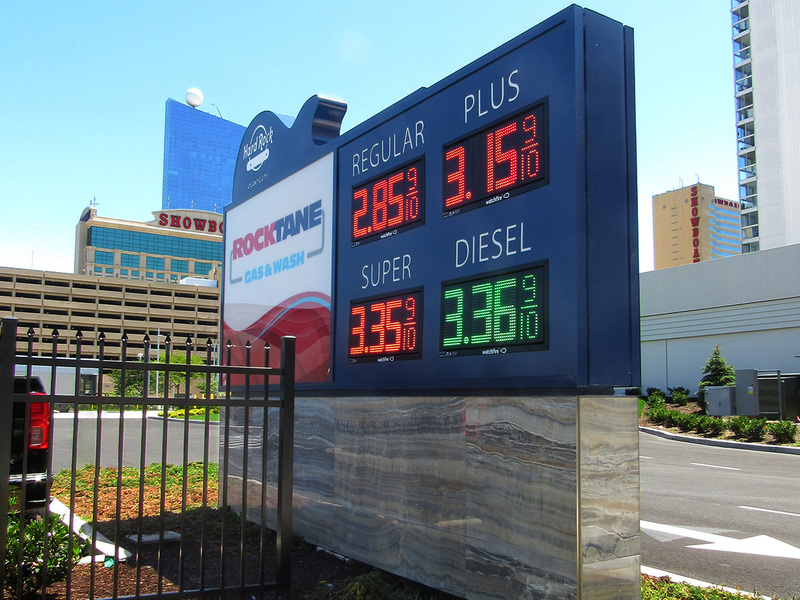 Interested in learning how others in your industry are using outdoor digital displays? Cabinet Weight 15 lbs. 20 lbs. 40 lbs. 56 lbs. Outside Dimensions 13 1/2" x 27" x 3 1/4" 17 3/4" x 35 1/4" x 3 1/4" 24" x 48" x 3 1/4" 33 1/2" x 64 1/2" x 3 1/4"
Cutout Opening 11 1/2" x 25" 15 1/2" x 33" 22" x 46" 31 1/2" x 62 1/2"
Our Price Watcher gas price displays interface with the leading Point-of-Sale systems: Gilbarco Veeder-Root, Allied Electronics, VeriFone, and NCR. Watchfire LED sign products are UL 48 & CUL 48 listed, FCC compliant and UL Energy Efficiency Certified.